When my son Damon was married last week at beautiful Orcutt Ranch in Chatsworth, I waited with the men of the bridal party in a small room before the ceremony. The room had copies of several historic photographs related to the life of William W. Orcutt, one of the most important people in the history of the San Fernando Valley, Los Angeles and indeed the American West. 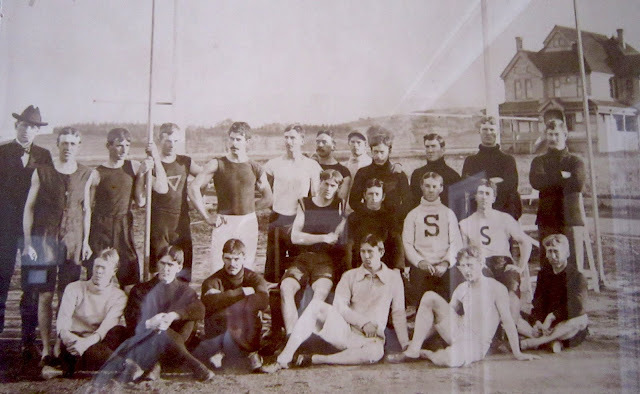 Here is an image of the Stanford University football team taken sometime between 1891 and 1895, when William Orcutt was taking advantage of the university's liberal arts education. The well-rounded Orcutt was a member of the university's debate team, the football team and a member of the first class to graduate in geology. When Orcutt saw tar covered bones at an oil drilling site near, what is now Wilshire Boulevard, his broad based education told him that they were fossils. His actions to preserve the fossils resulted in the preservation of the greatest collection of Ice Age animal and plant remains in the world. Beautiful Orcutt Ranch at the western terminus of Roscoe Boulevard was once William Orcutt's ranch home.